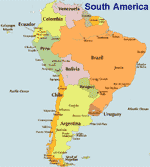 Directory of most popular South American newspapers and news sties searchable by country. Peru based non-profit organization, providing information and analysis about events across Latin America and Caribbean. News site on South American business and based in Miami, Florida. Providing regional news coverage in English and Spanish-language with emphasis on business information in Latin America. Leading news and information resource.